The Asiks (minstrels) are one of the most distinguished and brilliant communities of performers encountered within the realm of Turkish culture. Generally coming up singing lyrics and poetry to the accompaniment of the saz, the asiks are artists that give voice to all of the social events of the societies in which they exist, and write footnotes to history. Since its earliest periods of Turkic societies included religious figures known by titles such as Shaman, Kam, Baksi and Ozan, who performed both religious and social functions, acting as healers, poets and poets. It would not be mistaken to say that the asiks are local present-day artists who fit into the above groups. It is so clear that the asiks are equipped with these features, taken from tradition, that until the recent past, many asiks possessed these characteristics. Today, the asiks continue to exist, chiefly fulfilling the functions of poet and musician. Since the beginning of the 20th century, the term "Ozan" has become more commonly used in Turkey than "Asik." But as the term "Ozan" is used to denote all those who read poetry, that is, poets in general, we will continue to use the term "asik" here to distinguish traditional asiks from these other poets. Among the people, terms such as Halk asigi (folk asik), Hak asigi (asik of God) Saz Sairi (saz poet) and Sazli asik (asik with a saz) are used. Today, across the vast area from Central Asia to the Balkans, there is an asik culture, with different forms according to regional characteristics. Starting chiefly along the shores of the Caspian Sea, and including the entire Anatolian region, there is an asik culture that continues to live and maintain its existence. From the very old history of the asiks, we encounter one of the most obvious types of asik to leave his traces on Turkish culture in the Dede Korkut stories. With an instrument called a kopuz in hand, singing the praises of his people, Dede Korkut is considered the saint of the asiks. Among Turkmen tribes entering Anatolia from the 11th century on, we come across a great many asiks carrying out their profession, the majority of which for one reason or another are not poets, but professional asiks. By the 17th century, Anatolia seems to have become a land of asiks. 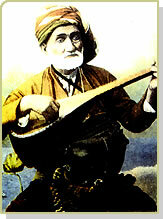 In his Seyahatname, the famous traveler Evliya Çelebi makes mention of many of the famous asiks of his time, who played their own deyis as well as regional songs, and gives information about their repertoires. Asiks were molded by the social environments in which they found themselves. When they left the social environment that created them, their tradition lost all meaning and importance. Whichever social class or region they belonged to, they read poetry and sang deyis in the coffee houses, musical cafes, inns, caravanserais, asik cafes, and especially village meeting houses. However we do not have many sources of information about asiks' performances at the Ottoman Palace. Murat IV and Mehmet IV in particular showed great interest in the asiks. This demonstrates that asiks were group of professionals who could perform their art among a great many social classes, from the lowest to the highest strata of society. Another mission with which tradition loaded these asiks is that of storytelling. They would tell stories such as Asik Garib, Hursid and Mahmiri, and Kerem and Asli for days on end, and thus help develop the people develop their imaginations and establish cultural ties to the past. In this capacity, asiks would sometimes perform music and stories one after the other, creating and making use of their own personal repertoires. In general terms, we can divide the asiks into two main groups: Itinerant asiks and local asiks.